Also, stay tuned to find out if someone is “lyin'” about lionfish! See previous posts about lionfish featured in Marine Monster Mash and Photography Friday. Lionfish are predators, native to the Pacific ocean, that have recently invaded the Caribbean region. Lionfish are voracious predators, eating fish up to half their own length, and their stomachs can expand up to 30 times their initial size. They also prey on a wide range of fish: about 40 different species have been found in their stomachs. Lionfish are expected to have many negative impacts on the Caribbean coral reefs they have invaded. Lionfish are eating juvenile fish that are important in maintaining adult population sizes, as well as important food sources for native predators. This can reduce the sizes of fish populations, including native predators due to lack of food. Lionfish are also eating ecologically important fish, like parrotfish. Parrotfish are important for eating algae that can compete with coral for space and resources. As lionfish eat parrotfish, however, there are less parrotfish to control algae, so it may outcompete coral. 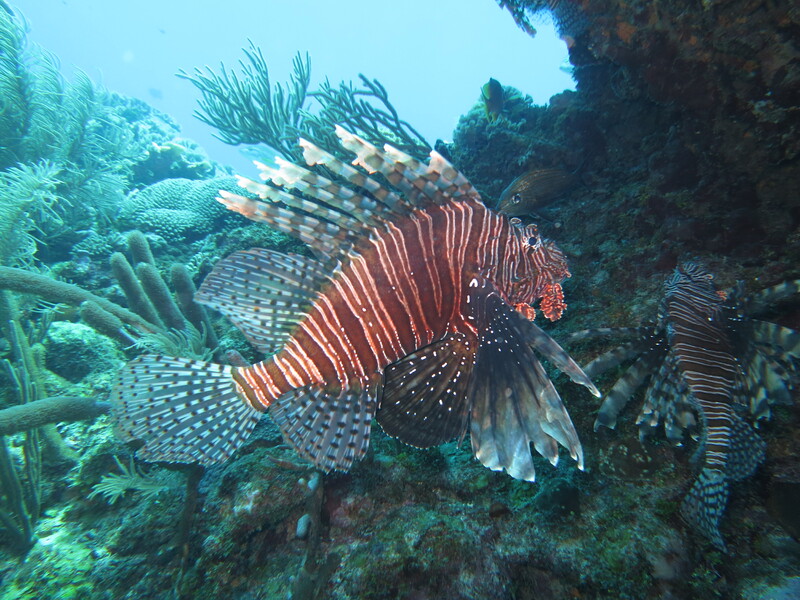 Other than ecological impacts, lionfish can also threaten important fisheries and tourism industries around the Caribbean. Little is known about lionfish in their native range, especially what controls them. So how are we going to control lionfish in the Caribbean? One option may be that we can just wait for native predators (like sharks and groupers) to control lionfish by eating them. But would this actually work? In 2011, a study was published by Mumby et al. 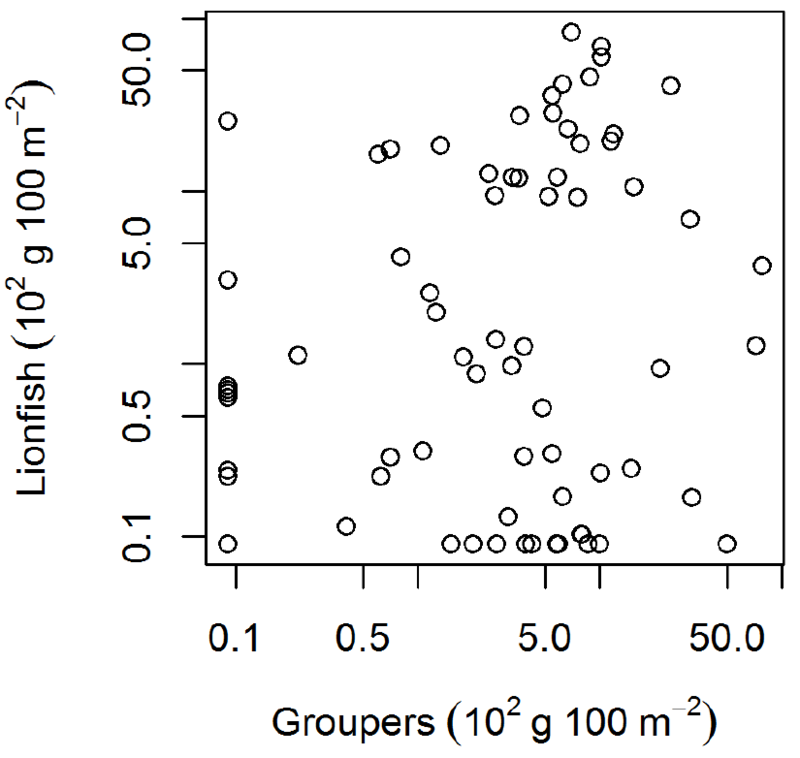 that suggests large Caribbean grouper can control lionfish. This was a small scale study in The Bahamas using 12 sites, 5 inside the Exuma Cays Land and Sea Park, a long-standing marine reserve, and 7 outside the reserve in fished areas. They found fewer lionfish inside the marine reserve, where there are large grouper, than outside the reserve where there are fewer grouper. They attributed this decline in lionfish to predation by grouper because lionfish have been found in the stomach contents of two grouper. They then conclude that grouper can control lionfish in this area. They suggest that if other areas have enough grouper (like other successful marine reserves), these native predators can control the lionfish invasion. A more recent study by Hackerott et al. (2013) suggests the opposite, that native predators are not controlling the lionfish invasion. This was a larger scale study, with 71 sites over 3 regions in the Caribbean: The Bahamas, Cuba, and the MesoAmerican Reef (Belize and Mexico). 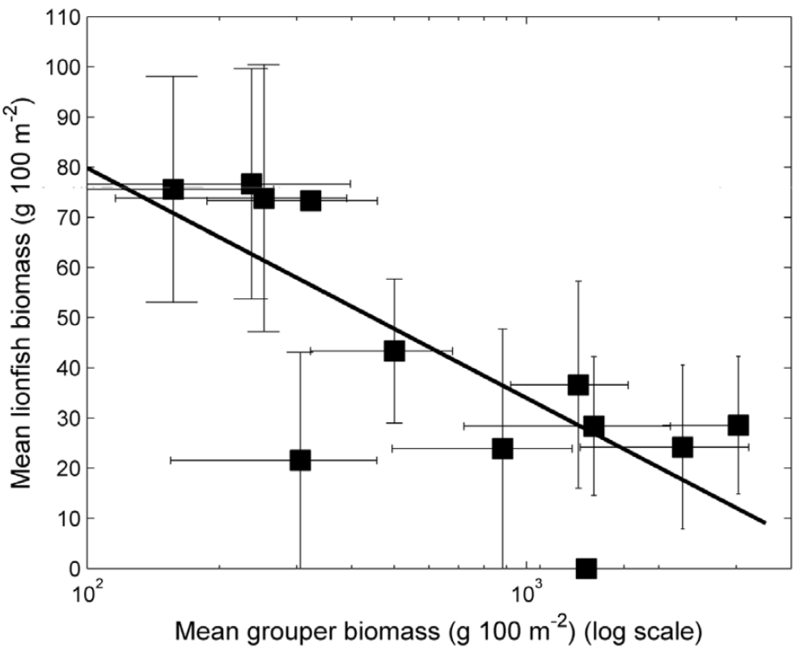 A key difference in this study was that they included abiotic covariates in the model. Basically, they also wanted to see how other factors besides grouper, like the location, the depth, the type of reef, the wind/wave exposure, and the protection status (marine reserve or fished area) of the sites influenced lionfish. They found no relationship between the amount of lionfish and native predators, even when predators were split into large vs small or when focusing on different types of grouper. However, they found fewer lionfish on sites in marine protected areas (marine reserves). You might think this supports the results of Mumby et al. 2013, but there is a very important difference. By including both the effects of predators and of protection status in the model, Hackerott et al. were able to show that this relationship (fewer lionfish in MPA’s) was not due to the amount of predators (lionfish had no relationship to predators), but due to the protection status itself. This is most likely due to reef managers removing lionfish from protected areas to prevent them from harming the reefs. This study concluded that native predators (like grouper) are not controlling lionfish, but that active management (like removing them from reefs) can reduce their abundance. Is someone “lyin'”? How can two studies have such opposing conclusions? Stay tuned to find out! Tags: Caribbean, Lionfish. Bookmark the permalink.